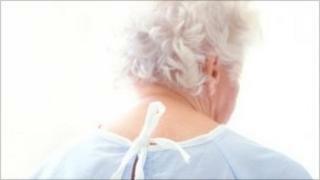 Hospitals in England and Wales are failing to provide good enough care to dementia patients, an audit has shown. The review by the Royal College of Psychiatrists found many patients were not getting the support on nutrition and mental health that they should. It suggested much of this was down to a lack of training - just one in 20 hospitals insisted on staff taking part in compulsory training. Ministers said the problems were shocking and must be tackled. One in four hospitals beds are estimated to be occupied by a dementia patient at any one time. But the review of nearly 8,000 case notes and more than 200 hospitals found a series of deficiencies in care. Just a fifth of hospitals had a system in place to ensure that staff knew which patients had dementia and how it affected them. What was more, a third of patients did not have a nutritional assessment during admission, while just 41% were given a formal mental test - both of which are considered good practice in dementia care. Delays were also reported in accessing specialist psychiatry services, which can help with issues such as medicine management. A third of patients had not been referred within 96 hours. The review team is due to make recommendations about what should be done. It is thought likely this will include a call for hospitals to provide mandatory training to staff because of the rising rates of dementia. About 750,000 people have the condition currently, but this figure is predicted to more than double in the next 40 years. Professor Peter Crome, who chaired the committee who carried out the audit, said care needed to improve. "There is still a reluctance by clinicians and managers to accept that the care of this most vulnerable group of patients is a core function of acute hospitals. This must change." The findings echo recent reports by the King's Fund health think tank and Alzheimer's Society. Care Service Minister Paul Burstow said: "There can be no excuses for these shocking findings. We know what good quality dementia care looks like. None of this is rocket science. There needs to be senior staff leadership on dementia in every hospital to make it a reality." Jeremy Hughes, chief executive of the Alzheimer's Society, said: "We know hospital staff want to do a good job but without training and support they are being prevented from providing good quality dementia care."